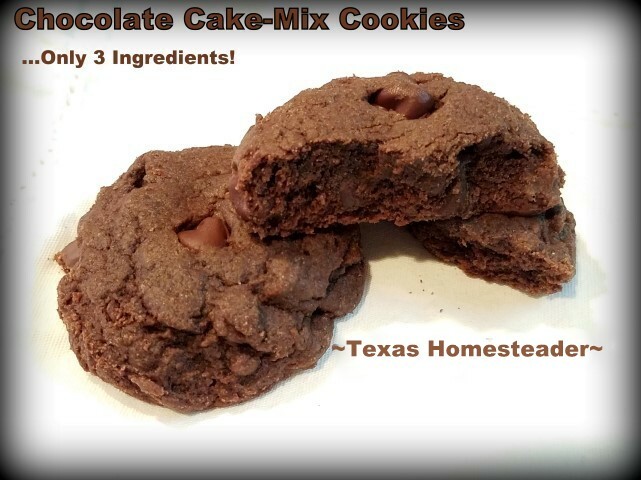 Only 3-Ingredients For Quick Cake-Mix Cookies! Did you ever want to make up a batch of cookies in a flash, but really didn’t want to go through the whole ordeal? You know, pull out your cook book, look up recipe, pull out all the ingredients, etc? Well boy do I have exciting news for you: Cake Mix Cookies! 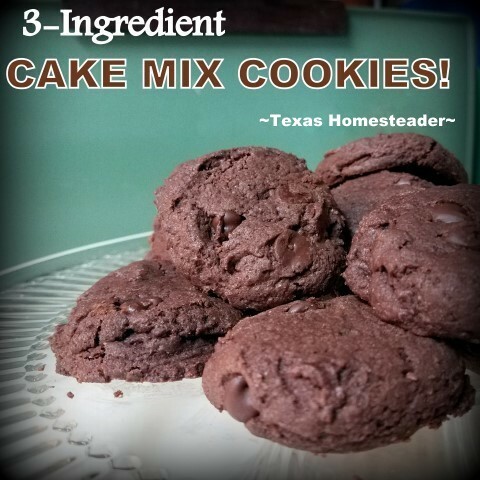 Only 3 ingredients, y’all, mix ’em up, bake ’em up, DONE. Recently we were invited to a dinner at a family member’s house and I asked what we could bring. The hostess requested RancherMan’s famous Green Bean Casserole so of course we made that to contribute to the meal. I ALWAYS Opt For Chocolate! It’s well-known fact that I’m a choco-holic. So of course my cookie choice is usually going to be chocolate! I used a box of chocolate devil’s food cake mix. I’ve made these cake mix cookies with lemon cake mix or strawberry and even spice cake mixes and they’ve all been delicious too. But if no other flavor is requested, it’s always gonna be chocolate for me! The recipe is easy to remember: 1 box cake mix, 1 stick of butter, 1 large egg. (My hens are laying small eggs so I used 2 small) Now let’s make some cookies, shall we?? I pulled out a box of devil’s food cake mix that I keep on hand for just such occasion. Then I pulled out a stick of butter (margarine just doesn’t produce the same results) and the eggs. Mixing the dough with my hands is so much easier than trying to use a utensil, but I suppose the KitchenAid mixer with the dough hook attachment would be a good option as well. While I was mixing the ingredients I preheated my oven to 350 degrees. Then I used my medium 1.5 tablespoon cookie scoop to measure the dough onto my cookie sheet. Then I gave each cookie-dough ball a gentle press to flatten them slightly and press the chocolate chips into the surface. Then into the oven for for 10-12 minutes. When I brought the baked cookies out of the oven I allowed them to remain on the cookie sheet for a couple of minutes. Otherwise they would be so soft they would scrunch when I tried to scoop them up. Then I placed them on a baker’s rack to cool completely. Using a medium scoop yielded 22 cookies. You could use a smaller scoop for more cookies, just bake them for 8-10 minutes instead. Anyway, this is one of my favorite stand-by cookie recipes when I need cookies FAST! Give ’em a try, I’m sure you’ll love them too! Need cookies in a flash? Check out these delicious cake-mix cookies. Only 3 ingredients. Medium cookie scoop makes about 22 cookies. Dump all ingredients into a bowl. Mix together with clean hands until fully incorporated. Use medium scoop to scoop cookies onto cookie sheet. Add 3-4 chocolate chips to the top of each cookie dough ball if desired. Press cookie dough balls gently to flatten slightly. cool for about 3 minutes on cookie sheet. Then move to cooling rack to cool completely. Note: You can use a smaller scoop to make more cookies, bake them 8 - 10 minutes. Cake-Mix Cookies – Only 3 Ingredients! 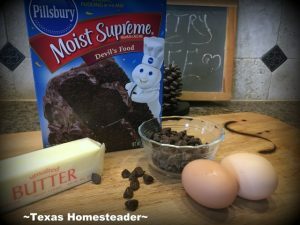 This entry was posted in Blog Posts and tagged Cooking, Recipes on June 25, 2017 by Texas Homesteader. My roommate in college made a similar recipe one day and it was DELICIOUS. Thanks for the memory and the remind that I should make some of these again. OMG. Was raining here yesterday all morning long so guess what I ended up making? 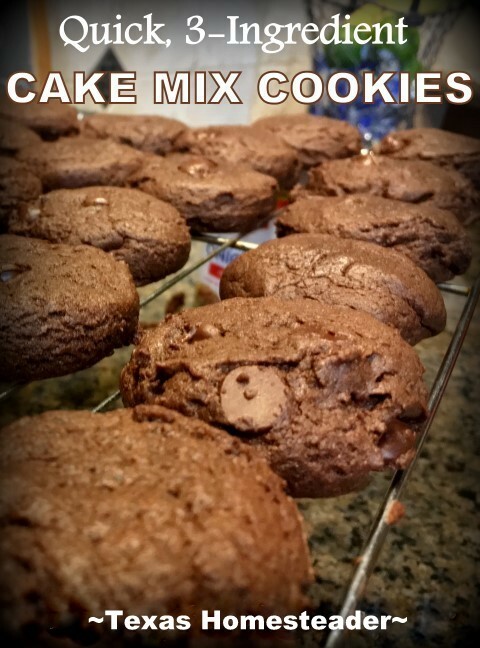 You guessed it………Chocolate cake mix cookies only I added peanut butter milk chocolate chips in mine. Normally I add the mini chocolate chips but wanted something different plus I like peanut butter and chocolate as they go so well together. Right now I just finished making a batch of microwave Bread and Butter Pickles. (no canning involved. )Very easy recipe. Tammy, Thank you for this. I use to make these, it seems like a life time ago, and had forgotten the recipe. I think I’ll write it down and put it in my cook book.